Eight years ago I wrote a piece called “Sports, Fund Raising, and the 80/20 Rule”. It had to do with how most alumni giving in higher education comes from a very small group of former students. Nobody was shocked or awed by the article. The sotto voce response seemed to be, “Thanks, Pete. We got that. Tell us something we don’t know.” That’s okay. It’s like my jokes. A lot of ’em don’t get more than a polite laugh; some get stone silence. Anyway, time passed and I started working closely with John Sammis. Just about every week we’d look at a new alumni database, and over and over, we’d see the same thing. The top one percent of alumni givers had donated more than the other ninety-nine percent. Finally, I decided to take a closer look at the lifetime giving data from seven schools that I thought covered a wide spectrum of higher education institutions in North America. 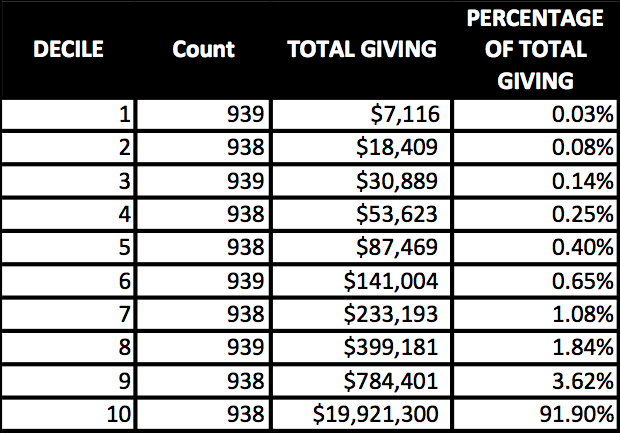 Once again, I saw this huge lopsided phenomenon where a small, small group of alums were accounting for a whopping portion of the giving in each school. That’s when I went ahead and put this piece together. I mentioned above that I looked at data from seven schools. After some agonizing, I decided I would end up putting you to sleep if I showed you all seven. So I chopped it down to four. Believe me, four is enough to make the point. To make sure all this is clear, let’s go through the data for School A. Take a look at Table 1. 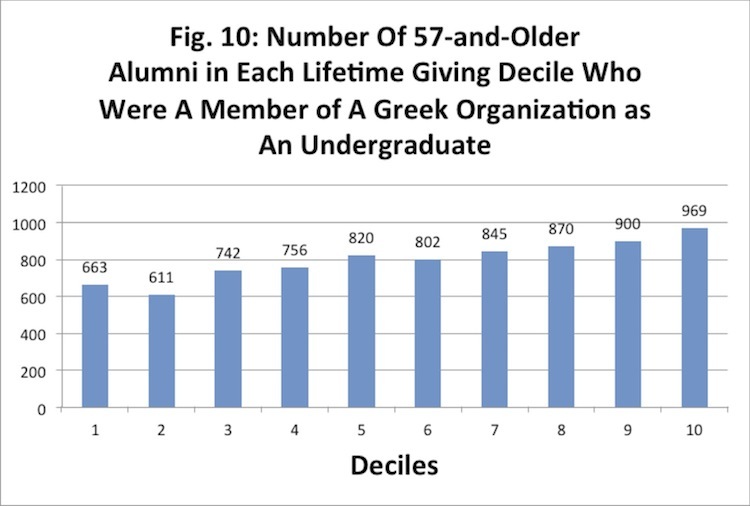 It shows the lifetime giving for all alumni donors at the school divided into ten equal size groups called deciles. 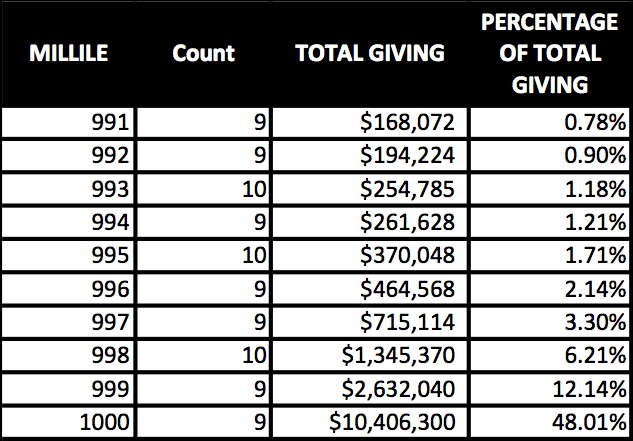 Notice that the alums in decile 10 account for over 95% of that giving. 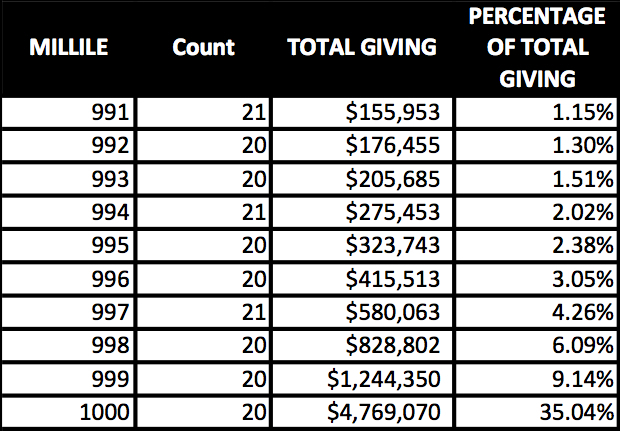 Conversely, the alums in decile 1 account for two tenths of one percent of the giving. Moving on to Table 2. Here we’re looking at only the top decile of alumni givers divided into one percent groups. 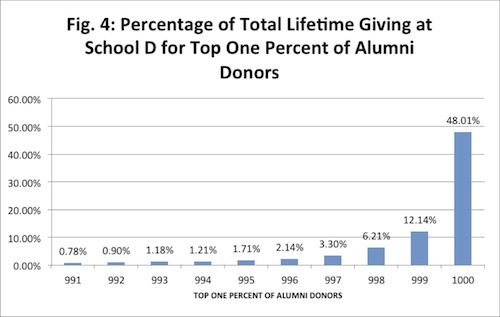 What jumps out from this table is that the top one percent of all givers account for more than 80% of alumni lifetime giving. 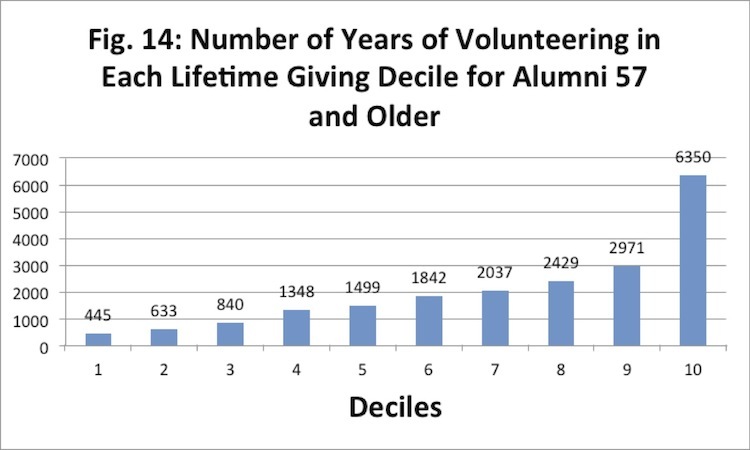 That’s five times as much as the remaining 99% of alumni givers. 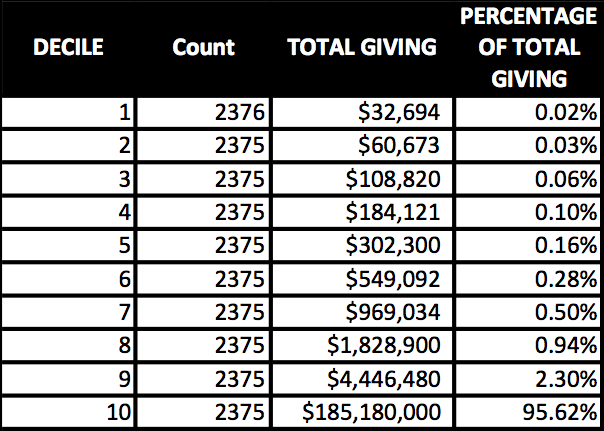 If that’s not lopsided enough for you, let’s look at Table 3 where the top one percent of alumni givers is divided up into what I’ve called milliles. That is, tenth of a percent groups. 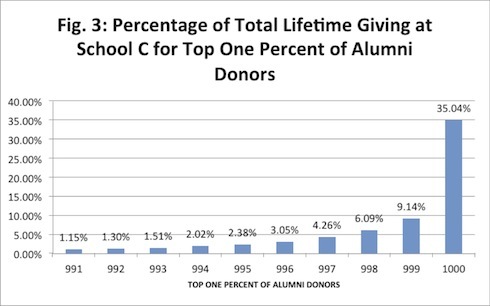 And lo and behold, the top one tenth of one percent of alumni donors account for more than 60% of alumni lifetime giving. Figure 1 shows the same information in a bit more dramatic way than does the table. What I’d recommend is that you go through the same kinds of tables and charts laid out below for Schools B, C, and D. Go as fast or as slowly as you’d like. Being somewhat impatient, I would focus on Figures 2-4. I think that’s where the real punch in these data resides. 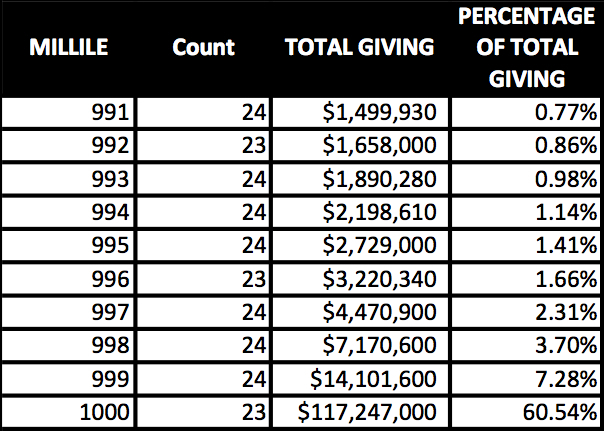 In School B over the half of the total giving is accounted for by three tenths of one percent of the givers. In School C we have pretty much the same situation as we have in School B. 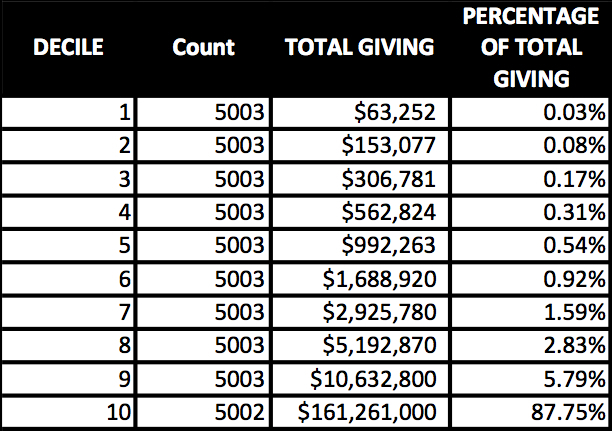 In School D over 60% of the total giving is accounted for by two tenths of one percent of the givers. Over the years I’ve gotten to know a number of thoughtful/idea-oriented folks in advancement. I asked several of them to comment on the data you’ve just seen. To protect the feelings of the people I didn’t ask, I’ll keep the commenters anonymous. They know who they are, and they know how much I appreciate their input. Most of the big money in campaigns and other advancement efforts does not come from alumni. I’m a bit embarrassed to admit that I had forgotten this fact. CASE puts out plenty of literature that confirms this. It is “friends” who carry the big load in higher education fundraising. At least two of the commenters pointed out that we could look at that fact as a sad commentary on the hundreds and hundreds of thousands of alums who give little or nothing to their alma maters. However, both felt it was better to look at these meager givers as an untapped resource that we have to do a better job of reaching. The data we see here reflect the distribution of wealth in society. The commenter said, “There simply are very few people who have large amounts of disposable wealth and a whole lot of hard working folks who are just trying to participate in making a difference.” I like this comment; it jibes with my sense of the reality out there. “It is easier (and more comfortable) to work with donors rather than prospective donors.” The commenter went on to say: “The wealthier the constituency the more you can get away with this approach because you have enough people who can make mega-gifts and that enables you to avoid building the middle of the gift pyramid.” This is very consistent with what some other commenters had to say about donors in the middle of the pyramid — donors who don’t get enough attention from the major giving folks in advancement. Most people in advancement ARE aware of the lopsidedness. All of the commenters said they felt people in advancement were well aware of the lopsided phenomenon, perhaps not to the level of granularity displayed in this piece. But well aware, nonetheless. 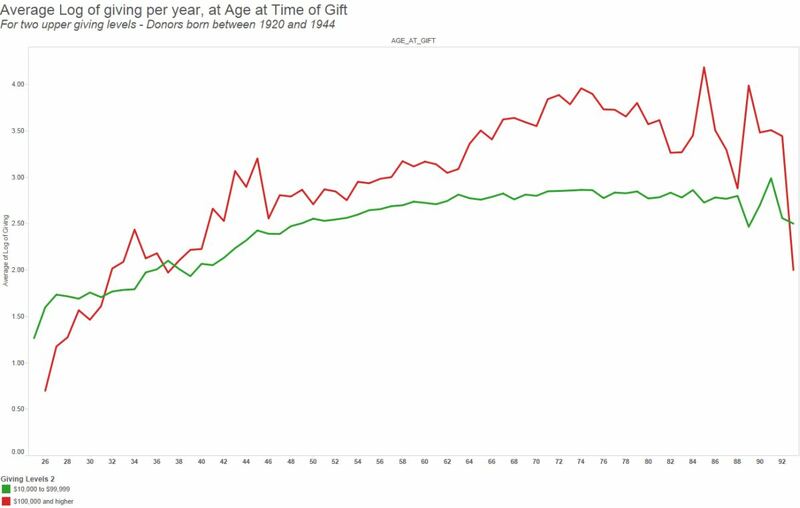 What you see in this piece underestimates the skew because it doesn’t include non-givers. I was hoping that none of the commenters would bring up this fact because I had not (and still have not) come up with a clear, simple way to convey what the commenter had pointed out. But let’s see if I can give you an example. Look at Figure 4. 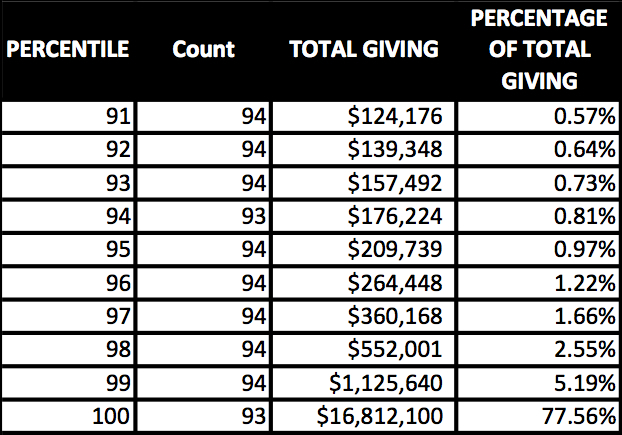 It shows that one tenth of one percent of alumni givers account for over 48% of total alumni giving. However, let’s imagine that half of the solicitable alumni in this school have given nothing at all. Okay, if we now double the base to include all alums, not just alum givers, then what happens to the percentage size of that top one tenth of one percent of givers? It’s no longer one tenth of one percent; it’s now one twentieth of one percent. If you’re confused, let’s ask someone else reading this thing to explain it. I’m spinning my wheels. But here’s a thought that I’ve had for a long time. When I look at the incredible skewness that we see in the top one percent of alumni donors, I say, “WHY? !” Is the difference among the top millile and the bottom millile in that top one percent simply a function of capacity to give? Maybe it is, but I’d like to know. And then I say, call me crazy, LET’S FIND OUT! Not with some online survey. That won’t cut it. Let’s hire a first rate survey research team to go out and interview these folks (we’re not talking a lot of people here). Would that cost some money to go out and get these answers? Yes, and it would be worth every penny of it. The potential funding sources I’ve talked to yawn at the idea. But I’ll certainly never let go of it. For years a bunch of committed data miners (we’re just a couple of them) have been pushing, cajoling, exhorting, and nudging folks in higher education advancement to do one thing: Look as hard at their internal predictors of major giving as they look at outside predictors (like social media and wealth screenings). It seems all that drum beating has been having an effect. If you want some evidence of that, take a gander at the preconference presentations that will be given this August in Minneapolis at the APRA 25th Annual International Conference. It’s an impressive list. know a good bit about topics like multiple regression, logistic regression, factor analysis, and cluster analysis? are practiced in the use of at least one stats application whether it’s SPSS, SAS, Data Desk, or R or some other open source option? are actively doing data mining and predictive modeling on a weekly, if not daily basis? The answer, of course, is that there is no single, right and easy way to look for predictors of major giving. What you’ll see in the rest of this piece is just one way we’ve come up with – one we hope you’ll find helpful. Here we’ll take you through the steps we followed to show that the big giving in most schools does not begin until alums are well into their middle years. We chose six very different schools (public and private, large and small) spread out across North America. For five of the schools, we had the entire alumni database to work with. With one school we had a random sample of more than 20,000 records. Given the fact that many students graduate after the age of 22, it’s safe to assume that the ages we assigned to these alums are slight to moderate underestimates of their true ages. 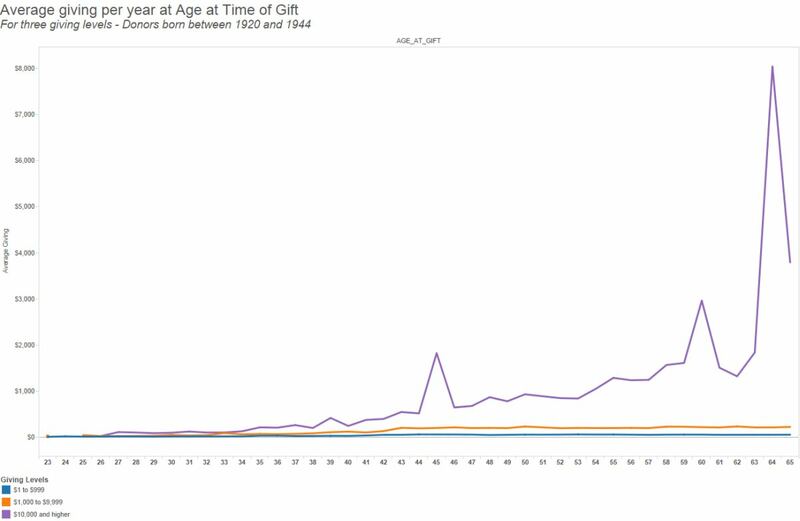 For all the records in each database, we computed each alum’s percentage of the sum of lifetime dollars contributed by all solicitable alums (those who are living and reachable). 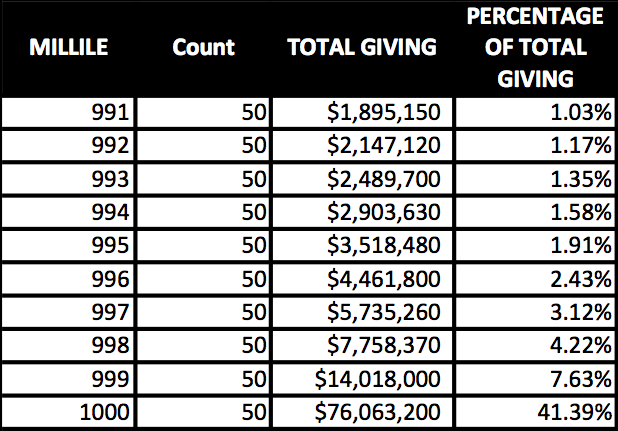 To do this computation, we divided each alum’s lifetime giving by the sum of lifetime giving for the entire database and converted that value to a percentage. Record A has given no money at all to the school. That alum’s percentage is obviously 0. Record B has given $39,500 to the school. That alum’s percentage is 0.079% of $50 million. Record C has given $140,500 to the school. That alum’s percentage is 0.280% of $50 million. For each of the six schools, we divided all alums into 15 roughly equal-sized age goups. These groups ranged from alums in their early twenties to those who had achieved or passed the century mark. 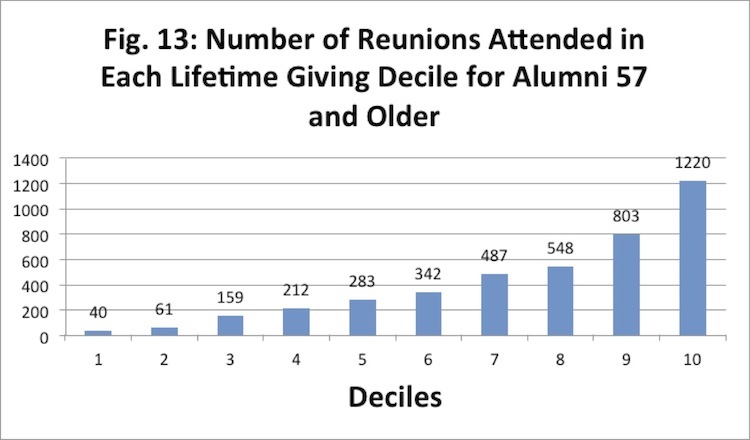 All alums 36 and younger have contributed less than 1% of the sum of lifetime givng. For all alums under age 50 the cumulative amount given is just over 7% of the sum of lifetime givng. For all alums under age 62 the cumulative amount given is less than 30% of the sum of lifetime givng. For all alums under age 69 the cumulative amount given is slightly more than 40% of the sum of lifetime givng. 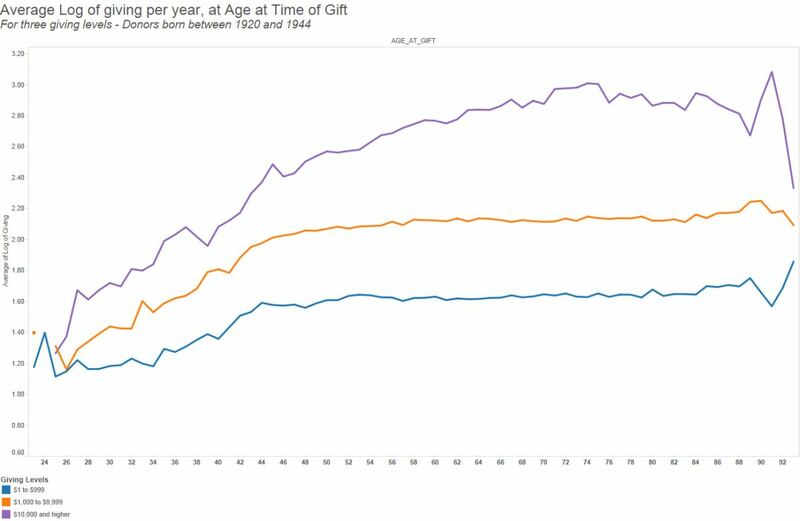 Well over 55% of the sum of lifetime givng has come in from alums who are 69 and older. 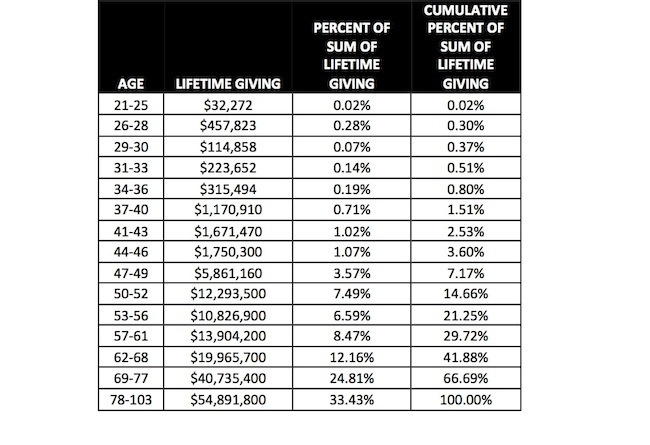 The big news in this table, of course, is that the lion’s share of money in School A has come in from alums who have long since passed the age of eligibility for collecting Social Security. Not a scintilla of doubt about that. But what about all the schools we’ve looked at? 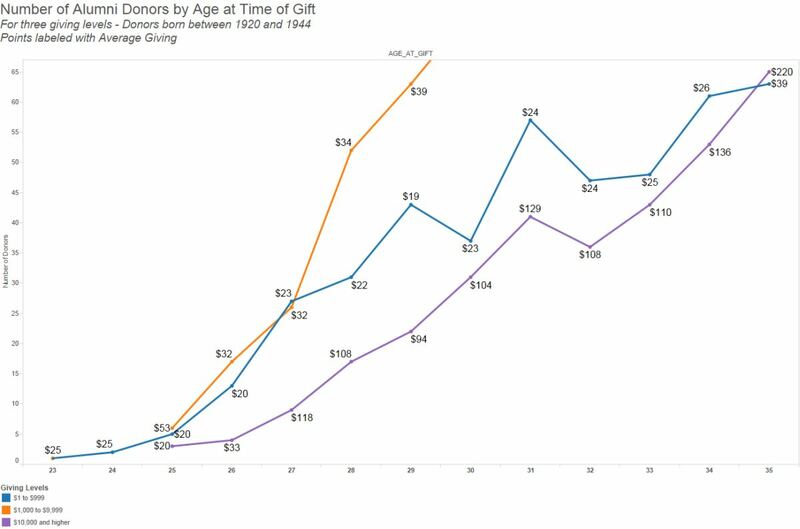 Do they show a similar pattern of giving by age? 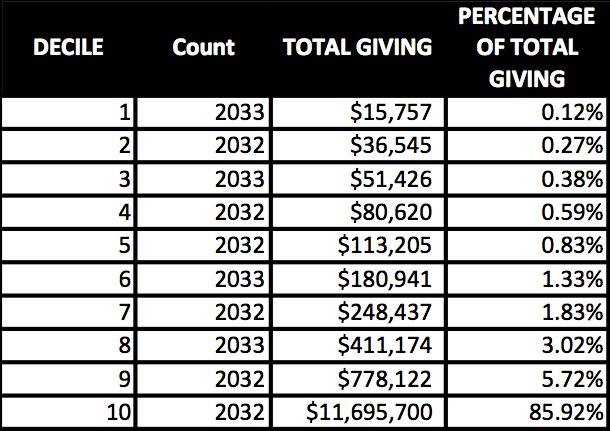 To help you decide, we’ve constructed Figues 1 – 6 that provide the same information as you see in the rightmost column of Table 2: The cumulative percentage of all lifetime giving contributed by alums up to and including a certain age group. Since Figure 1 below captures the same information you see in the rightmost column of Table 2, you don’t need to spend a lot of time looking at it. But we’d recommend taking your time looking at Figures 2-6. Once you’ve done that, we’ll tell you what we see. 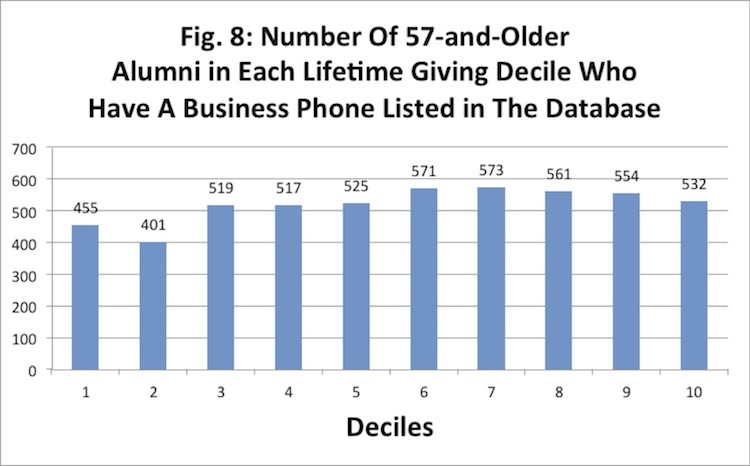 School B: Alums 48 and younger have contributed less than 5% of the sum of lifetime giving. Alums 70 and older have contributed almost 40% of the sum. 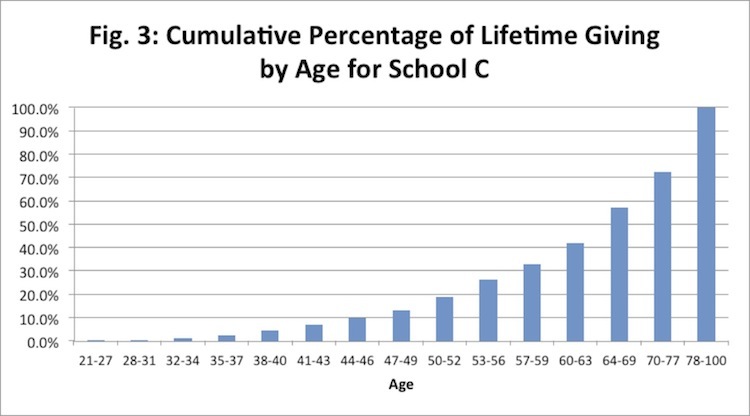 School C: Alums 52 and younger have contributed less than 5% of the sum. Alums 70 and older have contributed more than 40% of the sum. 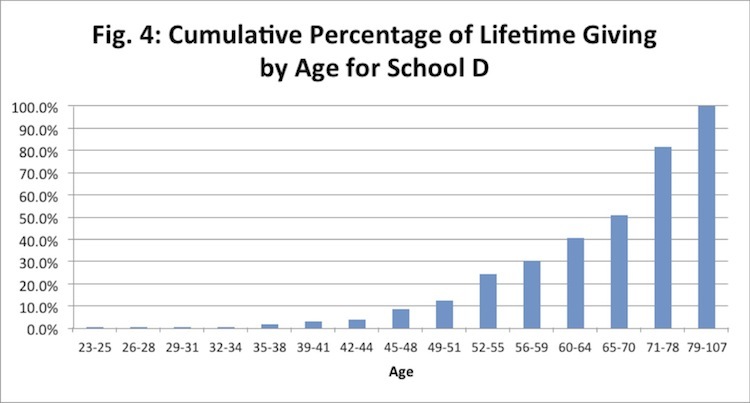 School D: Alums 55 and younger have contributed less than 30% of the sum. Alums 70 and older have contributed almost 45% of the sum. 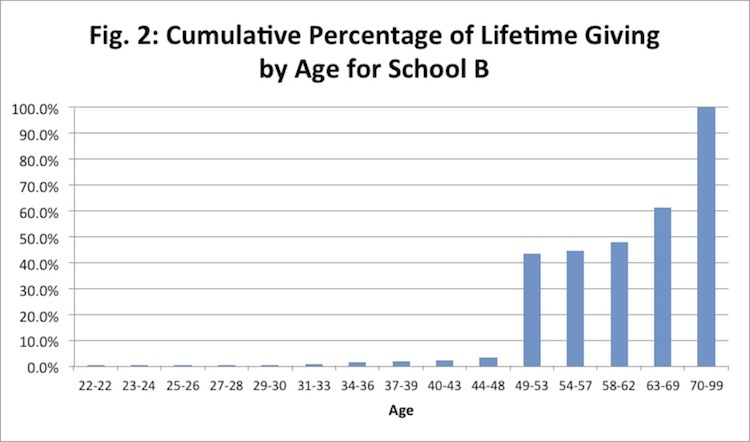 School E: Alums 50 and younger have contributed less than 30% of the sum. Alums 61 and older have contributed more than 40% of the sum. 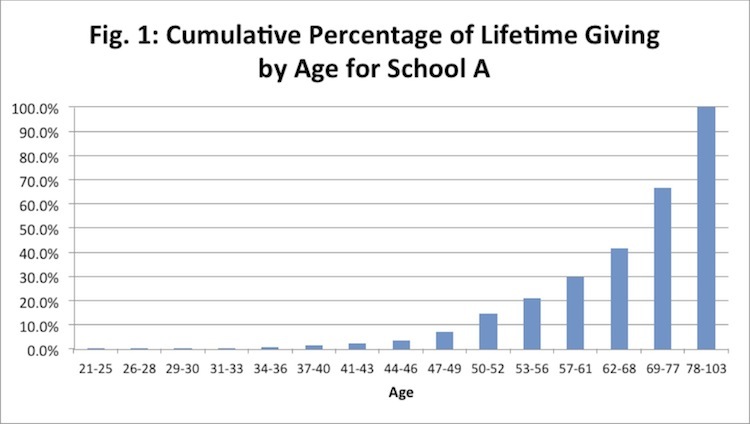 School F: Alums 50 and younger have contributed less than 20% of the sum. Alums 68 and older have contributed well over 50% of the sum. The big picture? It’s the same phenomenon we saw with School A: The big money has come in from alums who are in the “third third” of their lives. Up to this point we’ve either made our case or not that the big bucks don’t start coming in from alumni until they reach their late fifties or sixties. Great, but how do we go about identifying those alums in their forties and early fifties who are likely to turn into those very generous older alums? Identifying all the alums in a number of different schools who are in the forties and early fifties category. Collecting all kinds of data on these folks including giving history, wealth screening and other gift capacity information, biographic information, as well as a host of fields that are included in the databases of these schools like contact information, undergraduate activities, and on and on the list would go. 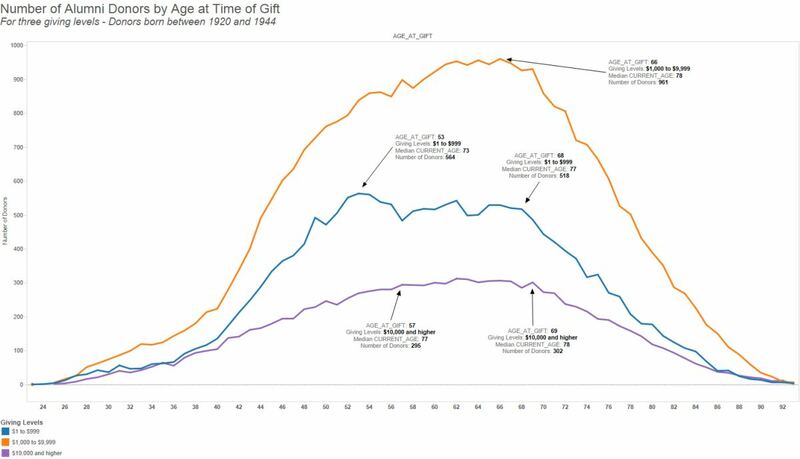 Waiting about ten or fifteen years until these “youngsters” become “oldsters” and see which of all that data collected on them ends up predicting the big givers from everybody else. Yes, of course. So what’s a reasonable alternative? 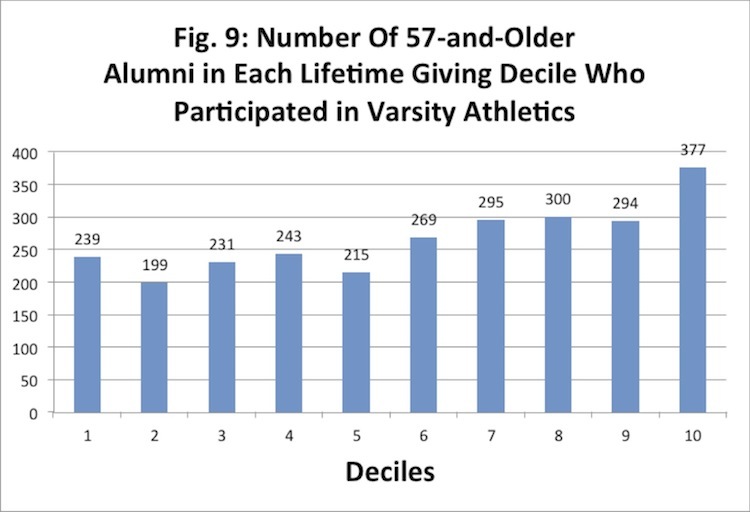 The idea we’ve come up with goes something like this: If we can find variables that differentiate current, very generous older alums from less generous alums, then we can use those same variables to find younger alums who “look like” the older generous alums in terms of those variables. 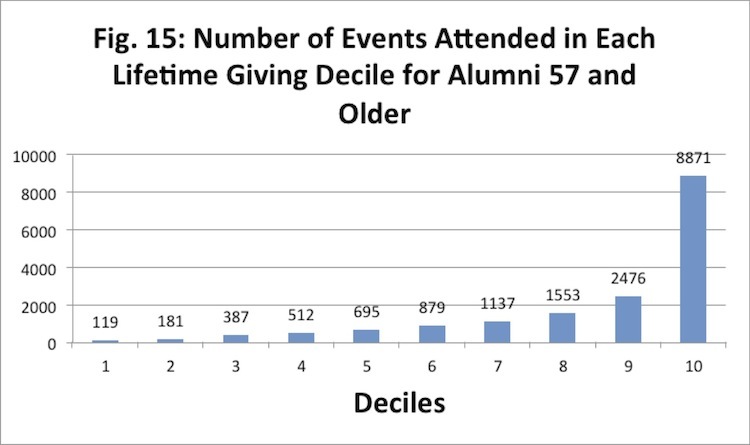 We divided alums 57 and older into ten roughly equal size groups (deciles) by their amount of lifetime giving. 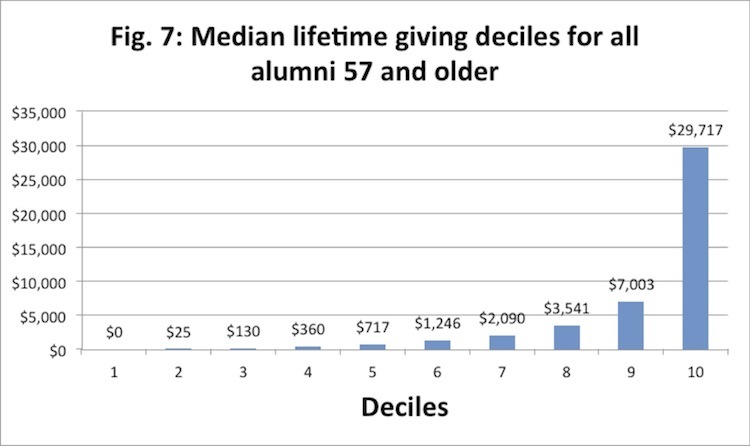 Figure 7 shows the median lifetime giving for these deciles. 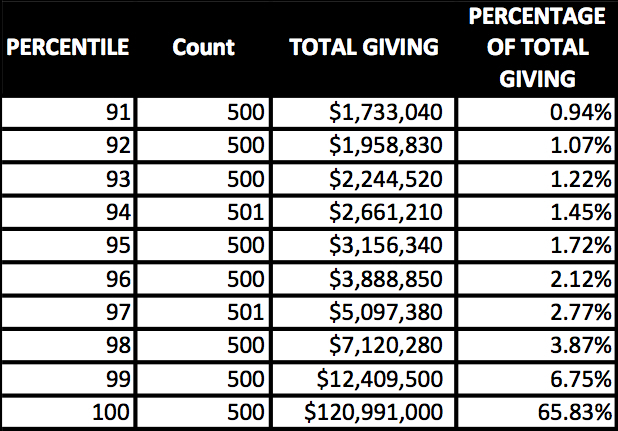 Table 3 gives a bit more detailed information about the giving levels of these deciles, especially the total amount of lifetime giving. Before we take you through Figures 8-14, we should say that the method we’ve chosen to compare the deciles on these variables is not the way a stats professor nor an experinced data miner/modeler would recommend you do the comparisons. That’s okay. We were aiming for clarity here. Let’s go through the figures. We’ve laid them out in order from “not so hot” variables to “pretty darn good” variables. It’s pretty obvious when you look at Fig. 8 that bigger givers, for the most part, are no more likely to have a business phone listed in the database than are poorer givers. Varsity athletics? Yes, there’s a little bit of a trend here, but it’s not a very consistent trend. We’re not impressed. This trend is somewhat encouraging. Good givers are more likely to have been a member of a Greek organization as an undergraduate than not so good givers. But we would not rate this one as a real good predictor. Now we’re getting somewhere. 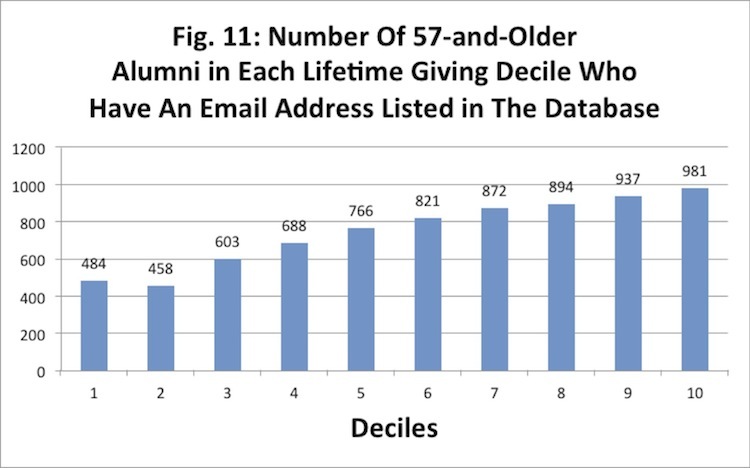 Better givers are clearly more likely to have an e-mail address listed in the database than are poorer givers. This one gets our attention. 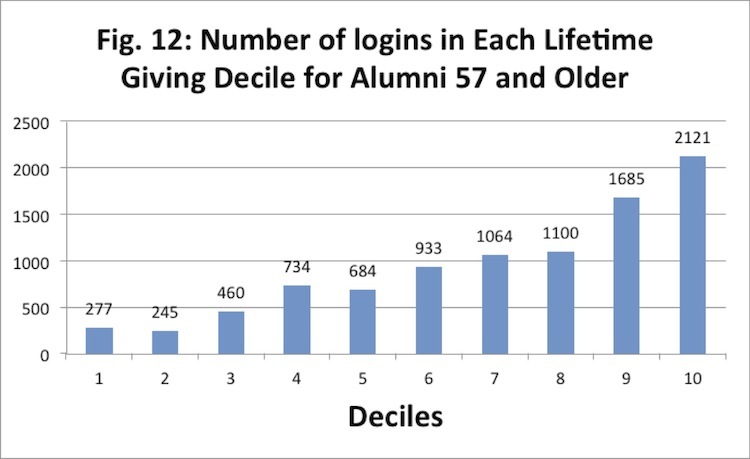 We’re particularly impressed with the difference in the number of logins for Decile 10 (really big givers) versus the number of logins for the lowest two deciles. At this school they should be paying attention to this variable (and they are). This figure is pretty consistent with what we’ve found across many, many schools. It’s a good example of why we are always encouraging higher ed institutions to store reunion data and pay attention to it. And this one’s a super no-brainer. Remember, we’re not assuming that you’re a sophisticated data miner/modeler. But we are assuming that you’re interested in looking at your data to help make better decisions about raising money. Without using any fancy stats software and with a little help from your advancement services folks, you can do the same kind of analysis with your own alumni data as we’ve done here. You’ll run into a few roadblocks, but you can do it. We’re convinced of that. Once you’ve done this kind of an analysis you can start looking at some of your alums who are in their forties and early fifiteies who haven’t yet jumped up to a high level of giving. The ones who look like their older counterparts with respect to logins, or reunion attendance, or volunteering (or whatever good variables you’ve found)? They’re the ones worth taking a closer look at. And after you have become comfortable with these initial explorations of your data we encourage you to consider the next step – predictive modeling based on those statistics terms we mentioned earlier. It is not that hard. Find someone to help you – your school has lots of smart people – and give it a try. The resulting scores will go a long way toward identifying your future big givers. As always: We’d love to get your thoughts and reactions to all this. The situation is familiar: Too many names, not enough time to create full profiles for everyone on the list. My first instinct is to call this a prospect research problem and not a data mining problem. When I was a prospect researcher, I had to create in-depth profiles for any prospect we were meeting with – even if it was the very first meeting and a gift would be years off, if it ever came at all. Today I work at a university with a much larger staff of development officers, but a research office that is (relatively) smaller. Full profiles for qualifying visits is unthinkable. DOs get no more than a summary briefing on prospects they’re meeting for the first time. This is for obvious practical reasons, but it’s my understanding that this is becoming the norm for many research shops – the full profile is produced only at an advanced stage of cultivation. So my first suggestion is, limit research to “top level” information only: Job title and company, giving history with the institution, maybe their Who’s Who profile if it exists … and not much more. My second thought is that a data-related solution is possible. I would try an approach that Peter Wylie uses: Take the top several hundred prospects (that is, according to propensity score) and sort them in descending order by lifetime giving. Think of the propensity score as summing up the affinity that the prospect feels for the institution. The lifetime giving dollar amount also provides evidence of affinity, but capacity as well. If a prospect has a very high affinity score AND has given in five figures, they’re probably a good major-gift prospect. Take the top 10 or so names and do in-depth profiles on them alone, leaving the others for later. Or, if wealth screening data is available, one could use that instead of lifetime giving to cross with the list of top-scoring prospects. But after thinking about it again, perhaps the real issue is contained in the original question: The researcher fears that fundraisers won’t have a plan, and they won’t have confidence in the process. That’s a fundamental problem, one that can only be addressed by communication, a certain amount of selling on the part of the data miner, and a lot of support from upper management.